Yesterday Auckland Transport finally confirmed that the Westfield station would close, after it was put on death row back in 2013 following the consultation for the New Network in South Auckland. There are a number of factors that have contributed to the demise of the station with AT citing its low patronage with little prospect for future growth given the stations catchment of light industrial land on one side and the Mangere Inlet on the other. As AT point out in their press release (below), the station has less than 330 passengers a day boarding or alighting at it, which is tiny when you consider that on the average workday the rest of the rail network carries about 65,000 trips. What’s more is the rest of the rail network is growing at a faster rate. Westfield isn’t the least used station however, Te Mahia has held that honour since Waitakere closed in 2015. Te Mahia was also on the chopping block in 2013 but AT decided to spare it after locals campaigned to save it, claiming the development nearby at the Manukau Golf Club would boost use – although I remain sceptical it will have much, if any impact. The graph below is based on data AT have provided us in the past on rail station usage and shows the origins and destinations for trips that involve Westfield to the end of June. 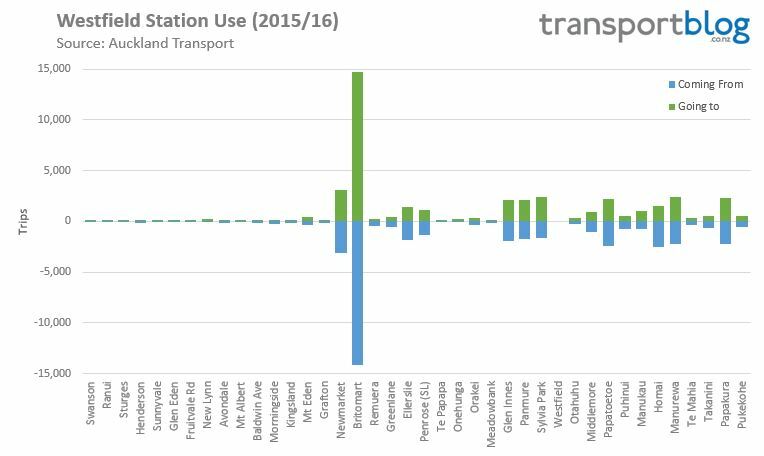 Of the two biggest, just over a third of trips are Britomart and further 7% are Newmarket. Perhaps what’s surprising about this announcement is not that it’s happened but that it’s taken so long to happen. As mentioned, Auckland Transport indicated way back in 2013 that they wanted to close the station. I had assumed they might do it when the electric trains were rolled out but they left it open. I then thought they might do it back in October last year when they rolled out the New Network in South Auckland, including opening the impressively upgraded Otahuhu Station just down the road. Closing stations, even under-performing ones like Westfield is never going to feel great, after all there might not be many of them but there are obviously people who use the station and they will be affected. The flip side to that is that closing it also allows AT to speed up the journey for everyone else who uses the trains from south of the station – although that itself will be balanced out by the opening of the new Parnell station which will only be stopped at all day by Southern Line trains. 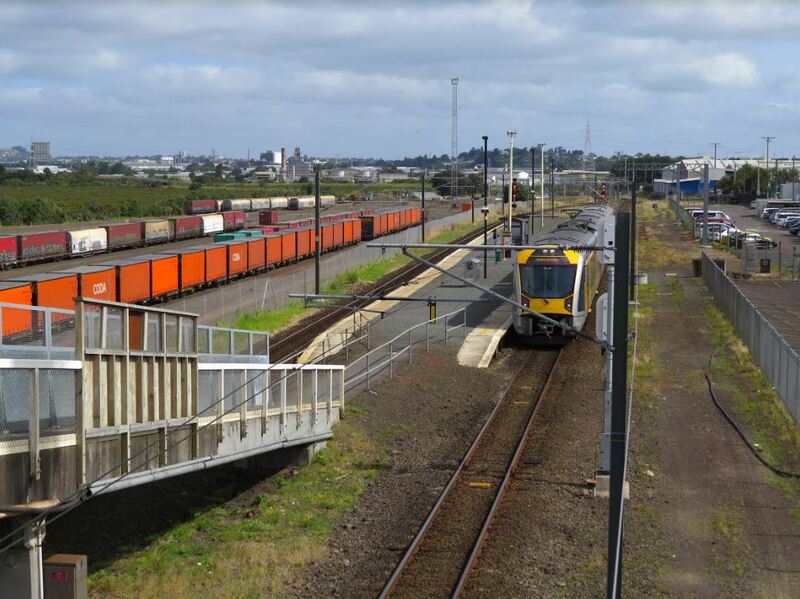 Westfield rail station in Ōtāhuhu is closing in March. Auckland Transport says the station is one of the quietest on the Auckland rail network, in November last year it had less than 330 passengers getting on and off services each day. Mr Lambert says forecasts of future patronage indicate that demand is likely to remain low given the location in a light industrial area and new public transport options created in the past few months. Other planned improvements in the south include the construction of a new bus station in Mangere Town Centre, the creation of a new of a new transport hub in Manukau and upgrades of Pukekohe, Manurewa and Papakura stations. Mr Lambert says there are bus stops nearby on Great South Road which provide links to a number of places including Otahuhu, Onehunga, Avondale and Britomart. Note: We’ve been a bit concerned recently about the comments threads of rail network related posts deteriorating into ugly arguments so we’ll be keeping a close eye on this post and strictly moderating it. So consider this a warning to stick to our user guidelines or your comment may be deleted. I’m not surprised ridership from Westfield hadn’t grown as access is bloody awful. I guess this seals it. Also catchment is bloody awful, as is connectivity. The station has no residents within walking distance, no town centres or retail within walking distance, only half a catchment of low intensity industrial/warehouse employment, no connecting buses (or need for them vis Otahuhu), and no intercept on cycling or driving routes. In short, it’s basically guaranteed to never get any patronage except a handful of industrial workers. No prospects for growth or change. Westfield like Southdown before it have had their day. they were built to supply workers to the freezing works (that are all but gone, AMP is a shadow of it’s former self) and the rail yards that now have a fraction the workers that they once did. There are a lot more people working in that area than many would think. But yes, quite a fixed number overall. No access from the Vesty Drive end was an issue. Once I even tried to ride there. Awful, very awful. I’ll be back working in the area this year but cant see myself riding a bike to Otahuhu. I live well within walking distance but I’m not surprised it is closing in favour of the redeveloped Otahuhu station. For me I’ll now have to walk to Mt Wellington highway, catch the 32 bus south to Otahuhu then train to Britomart. A bit of an adjustment but at least I have options – potentially bike to Otahuhu too. The biggest gripe is the lack of communication from AT regarding the closure – nobody could tell me a definitive date as to when it would close. Surely you would catch the bus up to Sylvia Park? Anyone have any update regarding whether Parnell Station will be gated or not? And how one will access it and what the ‘limited services’ it will be running entails? There was over a year between updates on the AT Project page and nothing since November. Maybe an opportunity for AT to build buy-in exists where they offer the monthly updates that we’re used to for things like The Waterview Connection, etc. I really like the line “Westfield isn’t the least used station however, Te Mahia has held that honour since Waitakere closed in 2015”. Te Mahia is actually a busy little station just not with those that choose to pay their own way, strategic gating of Manurewa and Papakura stations will curb that a little as they will start to run out of places to go to. I can see it from my window. There have already been double the recorded Westfield boarding today and it is only just past lunch. One stop up to the shops at Manurewa, two stops down to WINZ at Papakura there is no need to buy a ticket or swipe a hop card as even if the TIs see you they can’t make you get off. Where did you get today’s official boardings figures from? While not todays figures, I got it from the above story “station has less than 330 passengers a day boarding or alighting at it”. That’s the daily average across the whole year. Being an average, I can guarantee that today’s figures will be different. TBH, I don’t think the unofficial boarding stats for Te Mahia matter in the context of potentially closing down that station. I imagine it would be, and should be, the number of paying customers rather than non-paying customers that would determine whether a station was worth keeping open. I have no problem with that. Public transport is a service. If someone hasn’t got any money then why shouldn’t they ride free? It would probably come down to whether there is any link with the vandalism on the trains as to whether it is worth clamping down on, I have no idea whether it is the case or not. A extremely small amount of trouble/damage is caused by paying passengers while those that that don’t pay are extremely over represented in both. I don’t have a big issue with non payers riding in a civilized manner that doesn’t cause extra costs onto myself as a ratepayer or paying passengers through increased fares but unfortunately that is beyond most of the freeloaders. Just out of interest how do you know this is the case? While it’s quite possible most vandalism is caused by non-paying passengers, I’m not convinced most non-paying passengers are causing vandalism. I didn’t say most non payers were causing issues just that most issues are caused by non payers. So it would then seem a simple fix, get rid of the non payers and save a stack on damages. Sorry, I misinterpreted your comment ‘but unfortunately that is beyond most of the freeloaders’. Still interested to know how you know who is causing the vandalism. Talk to anyone that works the trains and they will tell you who is doing all the damage, most will also be able to point out with a high degree of accuracy who hasn’t paid. I’d probably want more than some second hand information before deciding to splashing out on gating Manurewa or Papakura. Also probably worth seeing how the increased enforcement powers work (if they ever get through parliament) first as well. Manurewa is on the short term list for gating along with Middlemore and a few others, while Papakura is on the slightly longer term list (mostly due to the size of the site) so they are both planned it is just when. There is a high correlation between those riding for free and those vandalising the train, littering, making trouble, rude, unpleasant. Its not about getting money from them, its about keeping those paying money to enjoy a nice ride without any hitch. I generally agree with this, for those few percent that go to great lengths to avoid paying, we might as well turn a blind eye because they obviously have a hard time affording to travel at all. Perhaps the answer is to give free or heavily discounted hop cards to those that really need them. That would simply formalise the situation. The vandalism, making trouble etc is a separate issue. Either everybody should pay, or nobody. in reality though … and good luck ever trying to enforce that. I admit to not paying, if a train is running late and I am therefore late to work, or if trains are cancelled and then I have to cancel appointments. I choose not not to pay. If the Hop post tells me to go buy a paper ticket, and then the machine can’t connect to the network, am I at fault? Do you mean whether they have any money, period; or whether they just don’t have any money on the day? I understand that is what the local board found. But te Maha could do with some improvements. It is the nearest station to me but I choose to use manurewa. You mean the right-wing middle aged and middle class Local Board that doesn’t represent Manurewa’s citizens? I live in Wattle Downs, along with Danni, and have no idea why you wouldn’t simply go down Holmes Road to get to Mahia station. Although I too prefer Manurewa station as it is safer and has better bus connections and parking. Te Mahia generally seems a lot more busier than Westfield, I believe there is a lot of fare evaders at Te Mahia which affects the stats. The whole “low patronage” excuse is a bit backward though, they are closing it to keep the Southern line travel time around the same (with a few mins improvement), with the addition of Parnell to the timetable in 12 March. If it wasn’t for that I don’t think they would of bothered closing it – they have been talking about it for ages. Parnell station was going to open anyway so closing Westfield means one less station than there would have been if it hadn’t have been closed. There is always a trade-off with stations between convenience and impact on travel times. It’s pretty clear from the low volumes and limited potential for growth, this station is not worth keeping. There are probably 200 trains a day stopping there for around 350 boardings, that is not good use of all the other passengers time. This should improve the flow of trains through Westfield junction as following southbound trains don’t have to wait for a previous train to vacate Westfield platform before being able to proceed over the junction. It will obviously also speed up Eastern Line journey times as one less dwwwweeeellllll. A sensible decision to improve the network far more than it hinders it all things considered. They can close the station now. However I would advise them to keep the infrastructure in case they want to reopen it in the future. It is never say never when the surrounding industral becoming economically feasible to redevelop into higher density residential and commercial. Also I think land surrounding Westfield station can be cheaply acquired and convert into a park and ride with little money. Not sure why they didn’t consider. A 200 berth carpark would probably only increase boardings to 550 per day, which is still quite low, I think it is better just closing it rather than spend extra money on PNR and continuing to slow the trains by having them stop there. Surveys on the Northern Busway stations showed around 50% of park n ride users used to simply take public transport the whole way, and only 50% were new users. So you can probably halve that. 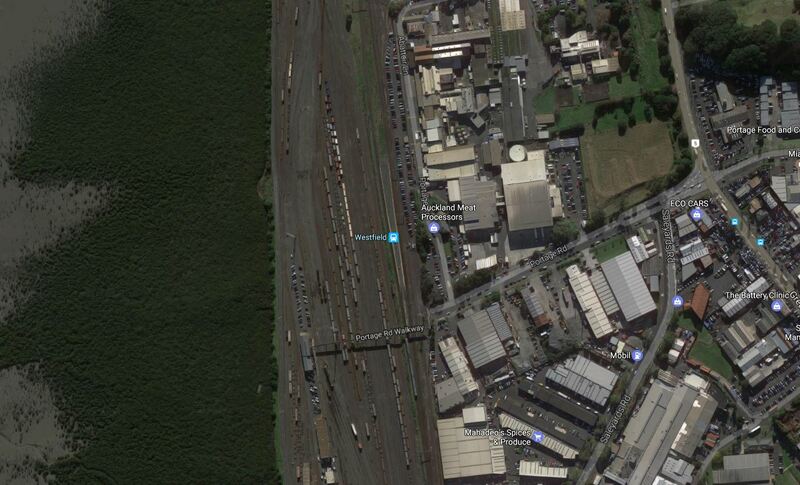 PNR facilities in the inner suburbs (like Westfeild) are a poor use of limited money. There are plans to double story one of the PNR at Papakura but for less money you could have a station at Drury (in the outer areas where PNRs make sense due to poor PT links available) with the same amount if not more carparks, this has the added benefit of an enlarged catchment area. The infrastructure stays for KR crew changes. Will Westfield station be completely closed with no trains stopping there or will it be like Wiri station where many trains stop for AT and other employees/contractors at the Wiri depot. Yeah, one random automated announcement from someone with a Northern English accent, when all the other automated announcements are some NZ guy! He must have been charging too much to come back and make that extra announcement. Haha, it’s clearly a computer voice. Agree, about time that goes. I did a switch once when I got on at the wrong line (Eastern instead of Southern) at Puhinui. I don’t know… but I did once overhear a woman on the train talking to her friend about why she doesn’t normally use Te Mahia, i.e. proximity to Manurewa. Similarly, it’s very difficult to spot from the Great South Road where exactly the walkway is and there are, as far as I remember, several car-related businesses alongside that stretch. Possibly related is concerns about safety (I mean… I know people who won’t go to Manurewa at night… a much better lit and more major station). All this adds up to great difficulty for a friend of mine who was trying to tell a story about how ridiculously full a train (pre-electrification) had been. The central problem was convincing anyone that three people had wanted to get on the train at Te Mahia. Westfield’s 330 passengers per day is a reasonable number considering its location. Up from 185 passengers a decade ago. Just been reading about the UK’s least used stations, there are a couple of dozen stations with less than 330 passengers per year!! Are those stations in a metro area, or some little village in the middle of nowhere? I can’t imagine those stations have 10 minute frequency services running through them. Geoff Marshall has visited a bunch for his channel: https://www.youtube.com/user/geofftech2 – it varies. Not quite, mfwic – unlike in NZ, in the UK there’s a formal legal procedure that has to be gone through to close a station, and permission (ultimately from central government, I think) is not guaranteed. That means it can be cheaper to keep a station open than close it, especially if there’s a franchise obligation on the Train Operating Company to provide a service. So there’s no need for people to go there each week to request that the train stops, though if a formal closure proposal were to be made clearly the more passengers there are the less likely that closure would be approved. Some of these UK stations are in villages and others are in urban areas. Not too many 10 minute frequencies I suspect. Disagree with those that say no growth options. AT could have linked up the awesome cycle way that runs along the harbour to allow those that commute on the south line a direct bike access, instead of the hopeless Onehunga dog leg. They wont and neither should they. We would need a rather large bureaucracy if every time a change was made, affected people had to be paid compensation, imagine if everyone impacted by the new network were paid compensation. Things change, that’s life, as long as the decision can be justified. Cheap move, great PR, ensures a bit of natural justice. A no-brainer. Maybe just free PT for 3 months. Whatever. This isn’t removing a bus stop meaning an extra 100-150m walk, this literally adds ks. That would be the opposite of natural justice if you do not pay out to everyone for every single change, no matter how big or small. You’d just be creating incentives to maintain status quo for everything. Great idea, so when AT installs hop card gates at Henderson then the hundreds of disadvantaged freeloaders should be compensated with some sort of free hop card? Just observed a group of 13 teens/twentys with a few children and babies get on at Henderson and off at Glen Eden. Not a paper ticket or hop card used by any of them. I’m surprised that the Westfield numbers are as high as 330. The industrial workers in the area, including KiwiRail loco staff would probably drive their cars to work, as would the staff at the adjacent freezing works and trucking and contracting yards. Are there any plans to run a bus service down Saleyards Road from the new Otahuhu station to mop up any of those industrial workers who don’t want to drive to work? Small point – Westfield is technically the interchange between the Southern and Eastern lines and so this moves that out to Otahuhu. I’ve personally made the GI to Penrose trip a few times which is such a minority trip that we can probably live with it being slightly more inconvenient, but e.g. Newmarket to Sylvia Park is about as fast by train as by bus which won’t be the case if the transfer is shifted to Otahuhu. Overall well worth the tradeoff; the station’s in an absolutely bizarre location to be honest, without there even being feed-in buses or anything.